Leading Manufacturer of twin die head from Indore. Available under model SMT-TDH50 and SMT-TDH75, Twin Die Head offered can handle different pipe sizes of 16-50mm as well as of 50-75 mm. Providing for uniform melt distribution throughout pipe circumference, the dual die support allows it to handle different pipe sizes in a smooth and convenient way. 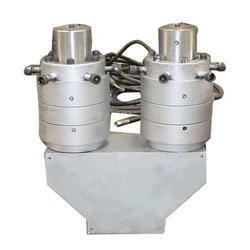 Further, these die heads also provide for superior flow properties as well as help in achieving higher outputs in smaller diameters. We can also custom develop these as per the specifications provided by the customers.